Monica Patsy Jones has worked hard to fundraise, plan and organize the second annual walk for missing and murdered Indigenous peoples of Vancouver Island. She is inviting people from all over Vancouver Island to join in a walk Feb.9 in Duncan B.C. in an effort to draw attention to the unsolved cases of Cowichan Tribes missing men and to the cases of other missing Indigenous people on the island. “I’m just a Cowichan Tribes member trying to find my nephews,” said Jones. No stranger to loss, Jones, now a grandmother, lost an older sister in 1970s. Her remains were found several weeks later in a rural area of Duncan and her death ruled a homicide. The case has never been solved. Jones is a dynamo when it comes to doing whatever she can to find her family members. When her first nephew, 14-year-old Desmond Peter, went missing from downtown Duncan in March 2007, Jones and other family members rallied to take part in searches of the area. Nothing has ever been found of Peter and in following years two more nephews disappeared from the same vicinity. In August 2015 Ian Henry, 26, went missing followed by Everett Jones, age 47, in February 2016. The families undertook extensive searchers in rivers and underbrush - starting with downtown Duncan where the men were last seen - to rural, outlying roads, trails and neighboring communities. “We’d get anonymous tips that there was a burial somewhere and we go and dig but we never found anything,” said Jones. Jones is focussing on keeping the missing persons cases in the eye of the public. She has held fundraising events to pay for missing posters and flyers and to pay for food, search costs and other expenses associated with the walk. Almost everything she’s needed in her efforts to find her loved ones has come out of her own pocket. “Even with fundraising, I’m still paying for some things out of my pocket,” said Jones. But in recent times Jones has reached out and received help from First Nations and the City of Duncan. “I met with Chief Bert Thomas of Halalt and they’ve sponsored us to cover the cost of insurance we need for the walk,” said Jones. Paige MacWilliam, director of Corporate Services for the City of Duncan, said their staff have been working on getting traffic permitting in place, which is necessary for the route. The walkers short route will start in the jurisdiction of the City of Duncan and head north over the highway, which is the jurisdiction of the Ministry of Transport, then onto the Municipality of North Cowichan. MacWilliam says the jurisdictions have been working well together to facilitate the walk and RCMP will be there to manage traffic. Duncan Mayor Michelle Staples will attend the walk to show support. “This is heartbreaking,” said MacWilliam of the missing men. “I wouldn’t wish that on anyone,” she added. Jones said more than 1,000 people showed up for the 2018 walk which is timed around the disappearance of Pacheedaht’s Everett Jones, who went missing from downtown Duncan Feb. 10, 2016. Age 47 when he went missing, Everett was a man of diminished mental capacity, making him vulnerable, according to RCMP. He was last seen in a busy area very close to his home. Despite extensive searches in the area, no trace of Jones has been found. The two Cowichan Tribes men disappeared under similar circumstances. Desmond Peter, 14, in March 2007 and Ian Henry, 26, in August 2015, both had mental health challenges. Neither has been found. The family of Tla-o-qui-aht woman Lisa Marie Young, who went missing from Nanaimo on June 30, 2002, were also at the 2018 walk. Monica Patsy Jones is hoping to see more people at this year’s walk. “My goal is to eventually get all of Vancouver Island’s chiefs under one roof to talk about this,” she said. She has invited Duncan’s mayor, several chiefs and both provincial and federal elected officials to speak at the event. “Everyone is welcome. Wear your Cowichan sweaters or regalia, bring your drum and your prayers and your songs,” said Jones. 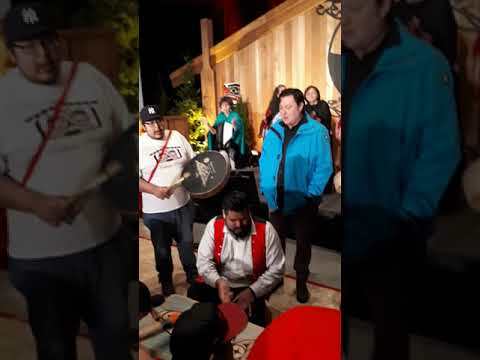 People will assemble at the Quw’utsun Cultural Conference Centre parking lot at 200 Cowichan Way (near Superstore) beginning 9 a.m.
“The idea is to follow the route were our loved ones used to go,” Jones told Ha-Shilth-Sa. She said the crowd will sing and pray. “It is my belief that maybe they will hear the prayers and it might bring them home,” she added.